"A comedy to arouse your appetite." 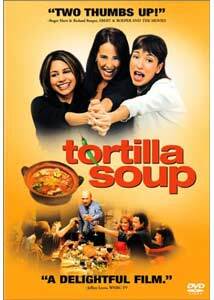 Tortilla Soup takes disparate ingredients—the semi-retired Mexican-American gourmet (Martin Naranjo—Elizando) who is losing his ability to taste, as well as his grown-up daughters to the world; the dull, repressed, uptight oldest daughter (Leticia—Peña) who fights change with her old-fashioned hairstyle, dress and manners; the Yuppie middle sister (Carmen—Obradors) who always has a dinner "announcement" (read: "pay attention to my success"), desires not the corporate rat race she is winning but to cook side-by-side with her father; and the spicy, rebellious youngest daughter (Maribel—Mello), always late to dinner, who in her hipness is diametrically opposed to her oldest sister, but who really suffers from a lack of self-confidence and understanding of self—and combines these ingredients with a pinch of comedy (including fun performances by Raquel Welch and Paul Rodriquez) to build an amusing little entrée depicting familiar familial goings-on.Like most of family life the film centers around the kitchen and the Sunday dinner table, a ritual gathering for the Naranjos. Having a secret desire to give up website management to attend culinary school, my heart pounds and my mouth waters as Martin cooks spicy, colorful dishes of grilled fish brushed with a handground roasted tomato paste, fried plantains, roasted tomato and pepper salad with Nopales (cactus), flan and, of course, tortilla soup. Nearly as spicy is the realistic in-fighting between these very different, but very similar sisters, their love lives, Lidy's secret admirer's love poetry, and the neighbor's obnoxious, yente mother (Welch). There are not many curveballs thrown at the audience, but even in predictability there is a certain sense of warmth and hominess that brings a quick smile to one's face. The performances all around are down-to-earth and entirely believable (even Welch's over-the-top yente is unfortunately a familiar persona to me), and it is in no small part due to the well-written script by Ramón Menéndez, Tom Musca and Vera Blasi, translated from Ang Lee's wonderful Eat, Drink, Man, Woman. The humor is natural and realistic, stemming from well-crafted dialogue without relying on slapstick or physical comedy (which I generally despise). If you can fight the urge that makes you run to the kitchen to eat, brought on by the sumptuous food preparation throughout Tortilla Soup, you will be in for a pleasant little treat. Image Transfer Review: Columbia TriStar delivers this disc with both the original, anamorphically enhanced 1.85:1 widescreen ratio and a "full-screen" (read: pan-and-scan) version on the other side. The OAR transfer is generally clean, with only the occasional blemish. The wonderful assortment of colorful foods and dress are seemingly well presented here, with very good saturation and no evidence of pluming, but a picture on the back of the box shows Elizabeth Peña wearing a purple shirt and the transfer comes across as a sky blue. Which is correct? Heck if I know... but one of them is wrong. Skintones are occasionally on the red side, and level of detail is variant with some scenes lacking crispness. These issues, as well as evident edge enhancement, don't overly distract one from the culinary and visual presentation. Bitrates average in the 6-7 range. Is there a reason to flip this disc and watch the film bloated and distorted in the wrong aspect ratio? Um, nope. Audio Transfer Review: Presented are both English and Spanish DD5.1 tracks. The dialogue is generally anchored to the center channel with occasional off-screen voices appearing from the appropriate direction. Some of the atmospherics are slightly gimmicky (chopping knives, clinking glasses, voices), as the direction through the surrounds does not seem spatially correct to the on-screen action. The score of assorted, airy Latin music is nicely deployed through the soundfield, although it lacks any significant low end. Not a reference track, but certainly appropriate to the subject.The Spanish is easily audible, but it seems no effort was made to cover up the fact this dub was recorded in a studio as it suffers from severe echoing. Extras Review: No real extras per se, not even a theatrical trailer. The rating here is for the inclusion of Spanish and English subtitles, particularly the latter. The 28 chapter stops are appropriate for a film of this duration. Tortilla soup is presented with an assortment of accoutrements of differing textures, tastes and spiciness, which come together to make a fun and homey dish. Not too spicy, not too salty, Tortilla Soup has the right measurement of comedy, a strong dialogue base, a smidge of drama, and cooks up just right.